We offer maximum insulation with our coldroom doors. 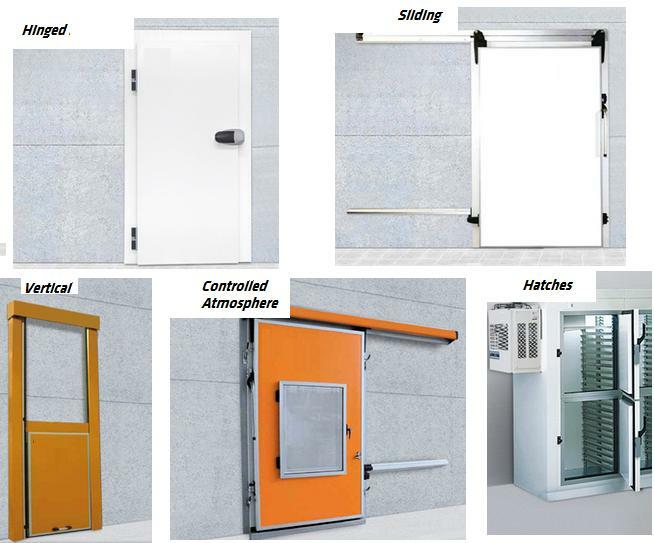 Hatched doors - Partially-housed hinged door of smaller size doors, for refrigerator cabinets, mortuary chambers and various sectors, such as patisseries, bakeries, etc. Sliding door designed exclusively for rooms with controlled atmosphere and areas where gas sea-ling is a main factor. The minimum temperature is -5°C. Vertical Doors - The manual or automatic guillotine door can be installed in all types of chiller, freezer or deep freezer cold rooms, down to -40°C. All our doors are made to the highest quality and can be tailor made to suit your needs, any opening size, thickness or height can be made to order.